Palestinian-American physicist and Professor of Physics at the University of Illinois at Urbana–Champaign Dr. Munir Nayfeh visited Birzeit University’s campus on January 8, 2017. Dr. Nayfeh met with President of Birzeit University Dr. Abdullatif Abuhijleh to discuss research efforts in nanotechnology and renewable energy generation and storage. 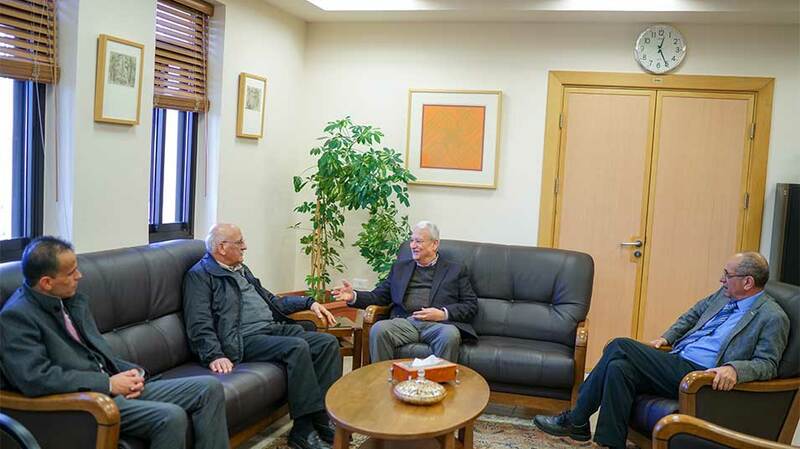 The meeting was attended by Vice President for Academic Affairs Dr. Faisal Awadallah; Assistant Vice President for Academic Affairs Dr. Mazen Hamed; and Assistant to the President Abdel Aziz Shawabkeh. Dr. Nayfeh also met with a number of faculty members from the Faculties of Engineering and Technology and Science, with plans to organize a nanotechnology and renewable energy conference later this year. “At a certain point in time, renewable energy generation became feasible. Technologies such wind farms, solar photovoltaic power plants, and geothermal solutions became well-known and easily applicable. But the energy generated by those solutions was, even if clean, was variable. Nanotechnology provides a method of generation that will ensure a steady, consistent flow of energy to homes, schools, and companies,” said Dr. Nayfeh.